En La Zona & Latino TV To Air Latin Grammy Specials Presented By Goya! LATV, the original national, bi-cultural, bi-lingual entertainment network is proud to its partnership with Goya, the country’s leading source for Hispanic food products, to present Latin Grammy’s special editions of En La Zona and Latino TV. On Wednesday, November 20th at 9 PM ET/6 PM PT, LATV will air Goya Presents Latino TV: Camino a Los Grammys. The one-hour special will preview the nominees of the 2014 Latin Grammy’s, to be held in Las Vegas. 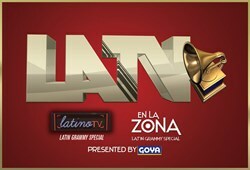 On Friday, November 22nd at 9:30 PM ET/6:30 PM PT, LATV will air Goya presents En La Zona’s Grammy Special. The half-hour special edition of En La Zona will feature an all-access pass to the 2014 Latin Grammy’s, with highlights from the red carpet, exclusive interviews with nominees and presenters, a peek behind the scenes of the largest gathering of Latin music industry elite, and a rundown of the big winners. It’s the Latin Grammy’s as you have never seen before. Only on LATV. LATV’s fully-owned subsidiary, American Latino Syndication, produces and distributes “American Latino” and “LatiNation,” two award-winning, Latino-themed TV programs that are broadcast on general market stations in over 100 cities nationwide. For more information, please go to http://www.LATV.com.